It’s a half hour before sunrise, and the ocean appears inky black as it slaps against the sand. A dozen fishermen are lounging in the boat master’s office in Punta Abreojos, laughing and talking about the party they’ll have that night. The mood is festive in this hamlet at the midpoint of Mexico’s Baja California peninsula because today is a day the town looks forward to all year long—the opening of abalone season. Actually the season opened four months earlier, but Punta Abreojos observes an unusual self-imposed ban. Rather than fish for abalone as soon as the government allows, in January, the community waits until April, when the shellfish have put on more weight. I head out into the Pacific Ocean with three fishermen in their 50s who have been working together since they were teenagers. “Horse” runs the engine, “Mole” hauls up the bags of abalones, and “Fish,” naturally, is the diver. Fish is in especially high spirits—he’s just returned from Pebble Beach, California, where he surfed and played golf. His buddies poke fun at him as he slips into a crisp new wet suit. The sun is up, and the water has turned from black to deep blue. Before they arrive at their fishing spot, Horse stops the boat over a reef crawling with abalones. “Those are the green abalone,” Mole says. A great white shark swims in the Isla Guadalupe Biosphere Reserve, 160 miles off Baja California. As one of two places in the world where these sharks congregate in clear water, it’s a magnet for adventurous dive tourists. Ecotourism in Baja brings hundreds of millions of dollars to Mexico. A few miles later Fish hops into the water. Within two hours he’s hit the catch limit and comes up with a smile and a bag full of healthy abalones. In most fishing towns in Mexico—or in much of the rest of the developing world, for that matter—men like these would be pulling a meager catch out of depleted waters, living hand to mouth. What makes these men so optimistic about the season ahead? How can they afford new gear and vacations at elite golf courses? The town’s fishing cooperative started in 1948 and for years operated like others—taking as much from the sea as it could. But in the 1970s, after a few disappointing harvests, the fishermen decided to try something new. They would manage the lobster (and later the abalone) for the long term instead of immediate profits. Today Abreojos and a few like-minded Baja communities following the same strategy catch more than 90 percent of Mexico’s abalones. Houses in Abreojos are freshly painted. The town has a baseball team and a surfing team. The lobster and abalone are canned at a modern processing plant and sold directly to Asia, maximizing profits. The town’s waters are guarded using radar, boats, and planes. Perhaps no one better reflects this success than 67-year-old Zacarías Zúñiga. His father helped found the cooperative yet struggled to make his daily catch. Zúñiga works as a quality control specialist in the cannery. Thanks to a scholarship to college offered by the cooperative, his son is a computer science professor. “We all work, and at the same time we all are owners,” he says. Punta Abreojos is not the only success story in this part of Mexico. Around the world, fish populations are crashing, and species such as tuna, turtle, and grouper are ever more scarce. Yet, in northwestern Mexico, a few communities have managed to protect their underwater resources. These micro-conservation areas were created by or with the support of the communities, which many environmentalists see as the key to conservation that works. How they did it holds lessons for the world’s fishing communities. Octavio Aburto dives near Isla Espíritu Santo, in the Gulf of California. The marine biologist studies why some reserves succeed and others fail. He’s found the secret is in the community that lives there. The history of Baja fishing is a saga of booms and busts. When author John Steinbeck visited the peninsula in 1940, he marveled at the incredible biodiversity—huge schools of manta rays, beds of pearl oysters, and so many turtles that older people here say you could cross the sea walking on their shells. But within a couple decades, man had found the limits, decimating the wild oyster beds. After that he turned to turtles, tuna, sharks, groupers, and a dozen other species. The Mexican government, making things worse, for decades encouraged unemployed workers to become fishermen in a program called March to the Sea. In southern Baja, which didn’t become a Mexican state until 1974, this led to a lone-cowboy culture that persists. “People are used to doing things on their own,” says Octavio Aburto, a marine biologist with Scripps Institution of Oceanography who has studied Baja fisheries for 20 years. A native of Mexico City, Aburto first came to the region in the 1990s and fell in love with its congenial fishing culture and beguiling underwater safari. In the late 1980s the waters around the Islas Revillagigedo were being targeted by commercial fishing. In 1994 the Mexican government made the area a reserve, and in 2007 sport fishing was outlawed. Today whitetip reef sharks, which have nearly vanished elsewhere, gather here by the dozens. After decades of overfishing, though, the region was seeing fishery collapse of target species as families moved from camp to camp chasing the remaining fish. In a few places small communities began to devise ways to maintain their resources. From these scattered success stories, five rules emerge as the key to sustainable, community-supported ocean management. First, like Abreojos, it helps if the site is fairly isolated, with just a community or two using it. Second, the community needs a resource of high value, such as lobster or abalone. Strong, visionary community leaders are the third necessity. Fourth, fishermen need a way to support themselves while the resources recover. And, lastly, the community must be bound together by trust. Many Baja tour operators once made a living from fishing. 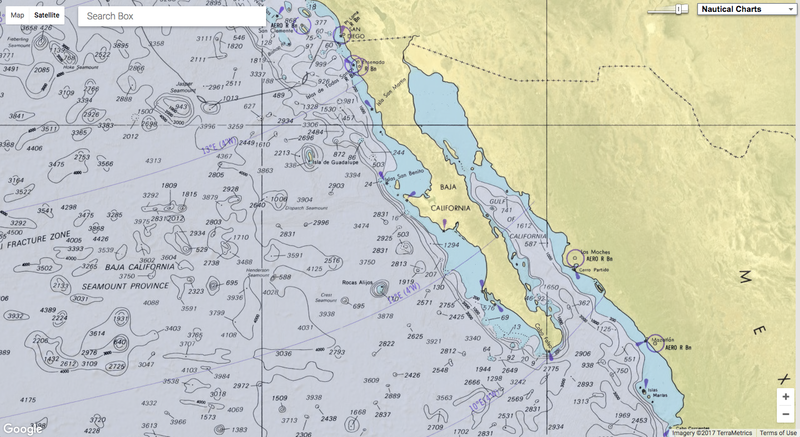 Dive operators in Cabo Pulmo are now trying to convince shark fishermen working near the national park (shown here) to go into tourism as a way to enlist them in protecting the ecosystem. In Baja several communities besides Abreojos illustrate the importance of these rules. One remarkable example of a high-value resource can be seen—and touched—in Laguna San Ignacio, a few miles down the coast. In 1972, according to local legend, Francisco “Pachico” Mayoral was fishing in his usual spot in the lagoon. As fishermen did in that region, he carried an oar to bang against the boat whenever a gray whale swam too close. Gray whales, everyone thought, were dangerous creatures capable of snapping a boat in half. Before long, one sidled up to his boat. Perhaps it was curiosity or daring, but for some reason Mayoral reached out to touch it. The whale leaned in and allowed him to stroke its smooth, spongy skin. And in that moment a cottage industry was born. By the late 1980s Mayoral and other fishermen were guiding tourists to the whales by the dozens. Today whale-watching is among the most important economic activities in the region, with ecotourism lodges now dotting the shoreline. Incredibly the gray whales and their calves still cuddle up to boats, though no one is sure why. Just as incredible is how the people there have managed it. Unlike Bahía Magdalena to the south, where guides chase down the animals in free-for-all whale-petting hunts, San Ignacio limits the number of boats on the water to around 16. Fishing in the lagoon is banned during the whale-watching season, so the whales have some peace and quiet with their young offspring. The preservation of this natural estuary does more than protect the whales; it also protects crucial nursery habitats for fish and invertebrates. In the mid-1990s Mitsubishi tried to build a saltworks near the mouth of the lagoon that could have had a deleterious effect on the ecosystem. The community, with the help of environmental organizations, mobilized a fierce campaign to block the project and eventually succeeded. I head into the bay on a 24-foot panga with tourists hoping to have the absurdly unique experience of petting a whale. Roberto Fischer, the fisherman taking us on the water, warns that there’s no guarantee we will touch or even see a whale. They must choose to come to us; we aren’t allowed to chase them. A few hundred yards off, a warden paid by the community eyes us to make sure we follow the rules. Suddenly a whale spout appears and a jolt of excitement rocks the boat. “I see it! Did you see it?” shouts a tourist. Timidly a mother gray whale comes over to inspect us. Her calf approaches less timidly, and soon it’s popping up on either side of the boat as the tourists cautiously stick out their hands. The mother joins in, and a third also takes a passing interest. “It’s whale soup!” Fischer says. There’s a time for journalistic detachment. But when a young whale leans up against your boat and opens its mouth, seemingly wanting to be petted, that is not such a time. I reach out my hand and touch the soft, knobby skin and then, astonishingly, pet its tongue. The massive creature looks at the dumbfounded writer and slides back into the water. Nowhere is the third rule of successful marine conservation—the need for visionary leaders—more evident than in Cabo Pulmo. In the 1980s it was a backwater fishing village near the tip of Baja. Too small and poor to afford ice machines to cool fish and to maintain roads to get them to market, Cabo Pulmo supported just a few fishermen, some of whom worked the reef—the only true coral one in the Gulf of California—just offshore. In the mid-1980s, locals say, biologists visited and loaned the fishermen a diving mask. What they saw alarmed them—pockmarks from their anchors and overturned coral heads everywhere. “We saw the reef like it was our own garden. But not like an ecosystem,” says Judith Castro, a community leader. “The fishermen didn’t know about the damage they were doing." Ocean life figures prominently in Baja history. Today these animals play an important role in tourism in places like Mexico’s Archipiélago de Revillagigedo Biosphere Reserve, in the Pacific Ocean about 240 miles southwest of Baja’s southern tip. Divers there see sights like a manta ray being cleaned by Clarion angelfish. In the early 1990s Castro’s brother Mario, a fisherman and diver, and Tito Mijares, a bar owner, led Cabo Pulmo’s fishermen to make a bold decision to support a marine reserve. By 1995 most fishing was forbidden in a 27-square-mile area, creating a legal no-take reserve—the only well-enforced one in the region. It’s not big, but it turns out you don’t need much space to bring back an ocean community. Today Cabo Pulmo National Park has two to three times more biomass than in 2000 and a vibrant economy now based on diving tourism. If your community boasts the area’s only coral reef or a pod of affection-hungry whales, developing a tourism model is an excellent way to save a threatened ecosystem. But not every fishing village has that luxury. Besides, tourism doesn’t create many jobs. In San Ignacio it supports only about 200 people and only for a few months a year. Then they go back to fishing. This brings up the fourth rule. For conservation to work, fishermen need a way to make money while they wait for their resource to recover. And the conservation efforts need manpower. To this end the community of El Manglito—on the estuary that borders the city of La Paz—has adopted an interesting strategy. Fishermen once harvested shellfish with abandon from the broad, shallow bay west of town. By 2009 very few were left. With financial support from Noroeste Sustentable, a nonprofit in La Paz, the fishermen—many of whom had turned to poaching—stopped fishing and began managing their resources. They were paid to watch for poachers and to do biological surveys estimating the amount of shellfish, now mostly a scallop-like creature called callo de hacha. The first survey estimated that fewer than 100,000 shellfish were left. Today it’s more like 2.3 million. “It’s always said that fishermen are the ones that destroy species, but not anymore. The sea has already given a lot. Now we give something back,” says Antonio “Chiflo” Méndez, a fisherman. El Manglito and Noroeste Sustentable did a lot right to bring the fishery back to life. But most important, the fishermen guarding or assessing the resource received salaries while the shellfish recovered. Paying them turned them from fishermen into professional environmental stewards. The ocean provides an incredible bounty for Baja. The Nature Conservancy estimates that nature-based marine tourism in Baja California Sur alone generates $300 million a year and supports more than 2,000 jobs. Tourists in Laguna San Ignacio gape at a gray whale. The last rule is perhaps the hardest to follow. For conservation to work, community cohesion and trust are essential. In places such as Abreojos and El Manglito, locals enforce the fishing bans when it comes to outsiders, but there is also a fundamental presumption that people in the community will play by the rules. In rural Baja, trust in one’s neighbor can be hard to find, but it’s possible to create it. At least that’s what a conservation organization called Niparajá, based in La Paz, is betting on. Niparajá works on sustainable fisheries in an especially desolate region of southeastern Baja, along the Loreto–La Paz corridor. Along the ragged shorelines and breathtaking vistas there are few people and even fewer roads. But those isolated fishing communities overlook some of the best unprotected habitat in the region. When Niparajá started working in those communities, it didn’t focus on fishing. Instead it promoted soccer tournaments. “How do you start building trust?” asks Amy Hudson Weaver, who coordinates the program. “You don’t start by talking about fishing. Sponsoring soccer tournaments in tiny towns might seem like a waste of time and money, but it slowly built trust between villages that have jealously guarded fishing grounds from each other. Next Niparajá took some fishermen to Cabo Pulmo to see the impact a fishing ban can have on ocean life. Eventually, after years of discussions, the villages decided to try conservation. Each selected a small area and agreed not to fish in it for five years. The areas are not big—the largest is just under three square miles—but it was a start. A northern elephant seal pup peers into the camera near Isla Guadalupe while other juveniles play nearby. Reserves create sanctuaries where once nearly extinct species can reproduce. How to maximize this ability to restock populations is a key question in ocean conservation today. “The idea is to have like a savings account,” says José Manuel Rondero, a 35-year-old fisherman who has watched lobster and fish populations plummet. To monitor the reserves, Niparajá struck on a clever idea. Each year it charters a research vessel for a trip down a 60-mile stretch of the corridor with biology students, government scientists, and fishermen from each community. Rondero rolls his eyes when told I’ll be trailing him. We drop into the water near a steep underwater slope. Many of the fishermen on the boat have dived in the Cabo Pulmo reserve, but several tell me they were unimpressed. Sure, there are a lot of fish, but nothing compared with what the corridor could have. The countless nooks and boulders are perfect habitat. Rondero takes out a tape measure, pulls it out 30 meters, and swims along it with a clipboard, counting fish one way and invertebrates the other. Then he sits and counts all the fish in his field of view. 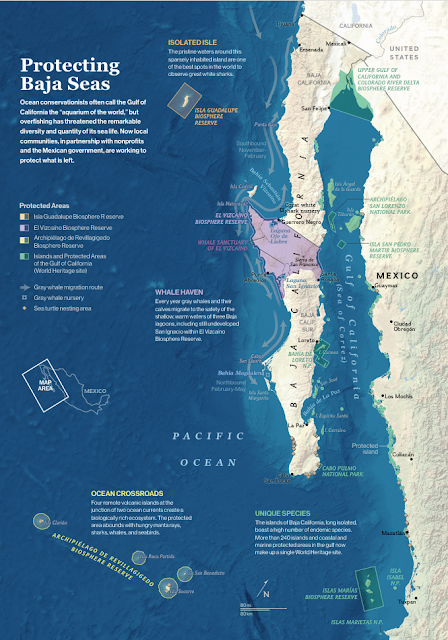 Baja communities employ different strategies to make a living from the ocean’s resources. Some rely on tourism, including a former fisherman in Bahía Magdalena who takes visitors to see sharks, whales, and pelicans diving for fish. Magdalena has suffered from failed conservation efforts, whereas to the north the people of Punta Abreojos carefully manage their resources for high-value products like abalone and lobster. The totals are a little dismal—a few lone fish and some urchins. Once we are out of the water, Rondero explains that this no-fishing zone is small and very new. In the bigger ones he’s seen biodiversity increase in just a couple of years, from a few goatfish to huge groupers, grunts, and parrotfish. A few miles north of here, one marine reserve has blossomed recently, and the communities have decided to expand it. “This year is better than all of the past years I’ve seen,” he says. From a scientific perspective, this research is crucial. The five largest protected areas on Earth are marine parks, and ocean life rebounds within their borders. But what kinds of habitats yield the best ecological results? How big must a park be to make a difference on the surrounding areas? The corridor’s tiny reserves are the perfect place to answer these questions. But these trips also serve an equally important outreach role. In Baja, as in most of Mexico, few trust the government, and many view conservation efforts as shadowy conspiracies. But in the corridor each community hears back from fishermen who have worked alongside marine biologists. At night, after grueling days of swimming transects, fishermen, scientists, and government employees hang out together, talking and laughing. Whenever he returns from the research vessel, Rondero says, his community peppers him with questions. Whale sharks frequent the bays around La Paz, perhaps attracted by the calm, shallow water. Their appearance just offshore is as steady as clockwork. Today researcher Dení Ramírez Macías of Whale Shark Mexico calculates that whale shark tourism brings an estimated $1.3 million to the local economy. In fact, the tourist boats in La Paz sometimes outnumber the whale sharks. “I have a lifetime of great fishing experiences,” he says, sitting on the boat one evening. “I’m proud to be a fisherman. Gazing across the water at the stunning coastline, I ask whether he wants his daughter to marry a fisherman. He pauses and then smiles.